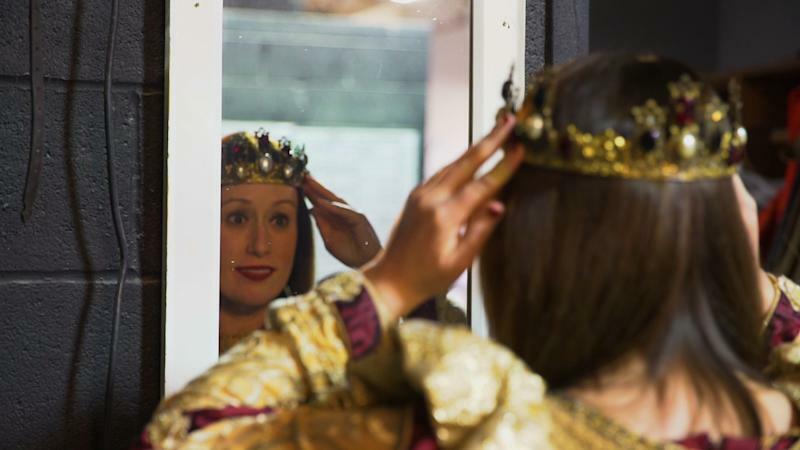 Henderson, an actress, has performed in nearly 3,000 shows during her tenure at the Lyndhurst, New Jersey Medieval Times location, and currently plays Queen Doña Maria Isabella. The first U.S. Medieval Times took place in 1983 in Kissimmee, Florida. In the 35+ years since, Medieval Times claims that more than 60 million guests have attended shows at the 9 castles in the United States and Canada. The narrative of the show evolved over the years. Most recently, in 2017, the show was rewritten to favor a queen over king as the lead for the first time. Along with donning the crown, another perk of being queen at Medieval Times is horseback riding training. “One of the more thrilling elements of becoming queen was getting to go through that with my queen sisters and learn how to ride a horse,” Henderson said. Outfitting knights, and now the queen, with their loyal steeds at a nationwide scale resulted in Medieval Times becoming the largest breeder of Pure Spanish Horses in America. Medieval Times also happens to be a flexible job. Compensation varies for performers. Sergio Aguirre, a former knight at the Medieval Times’ Chicago castle, told Yahoo Finance that a squire tops out at $11/hr, whereas knights start at $13/hr and can eventually make approximately $30/hr. And for Henderson, the 3,000 performances have yet to take the magic out of it.